As a New York transplant, I love that Philly offers most of what's available in NYC, but on a smaller, more relaxed, and affordable scale. The one thing that I wish Center City proper did offer? A decent Korean restaurant, replete with BBQ grills and high-powered vents. Admittedly, I hear there are great offerings in Northeast Philly and I've heard good things about Miga in the Fairmount/Logan Square area. But for the most part, it's a barren wasteland when it comes to decent Korean cuisine. 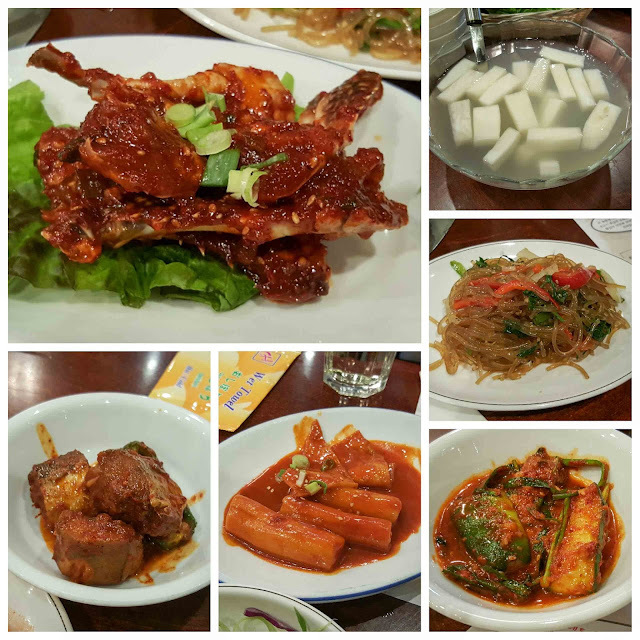 The type of Korean food I'm looking for? Just look towards Queens, NY. 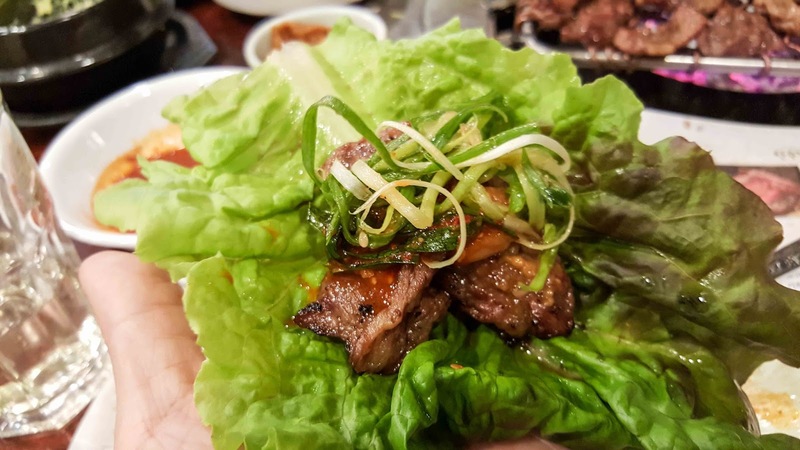 Clearly the place to go if you're looking for real deal Korean BBQ and the like. 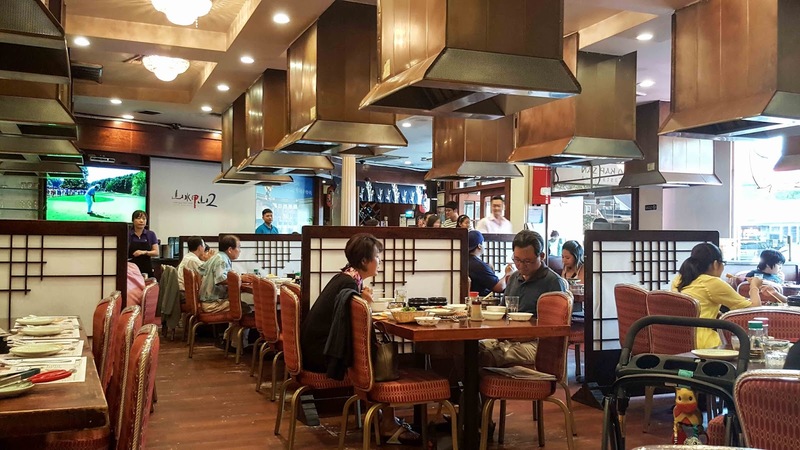 San Soo Kap San is a stalwart when it comes to Korean BBQ, with great food and plenty of high-powered industrial vents to deal with the smoke that comes with grilling your meat tableside. Regardless, I would leave your favorite coat in the car. Otherwise, you'll come out smelling like smoky sweet BBQ marinade for a few days. 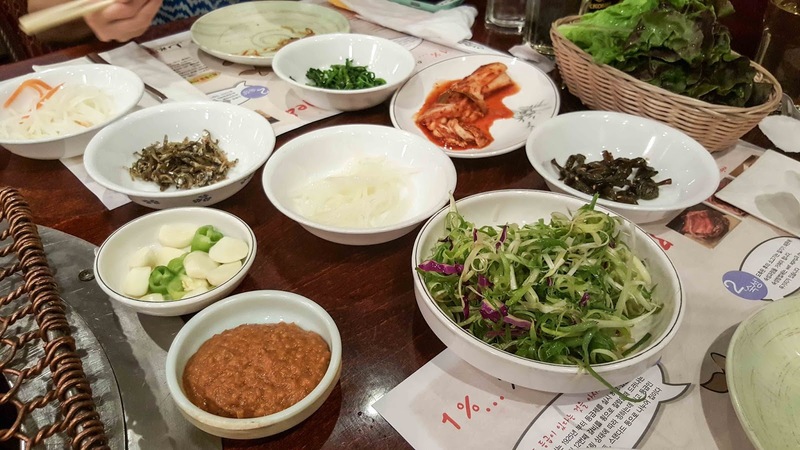 For those not in the know, Korean food typically comes with a slew of banchan, or side dishes. They're not to be eaten by themselves necessarily, but in combination with your main dishes. There are plenty of options from spicy crab, spicy rice cakes, spicy fish, spicy kimchi, spicy cucumber ... you get the picture. We like spice! But there's also sesame-infused glass noodles and plenty of palate cleansing items like sweet and slightly pickled radish. 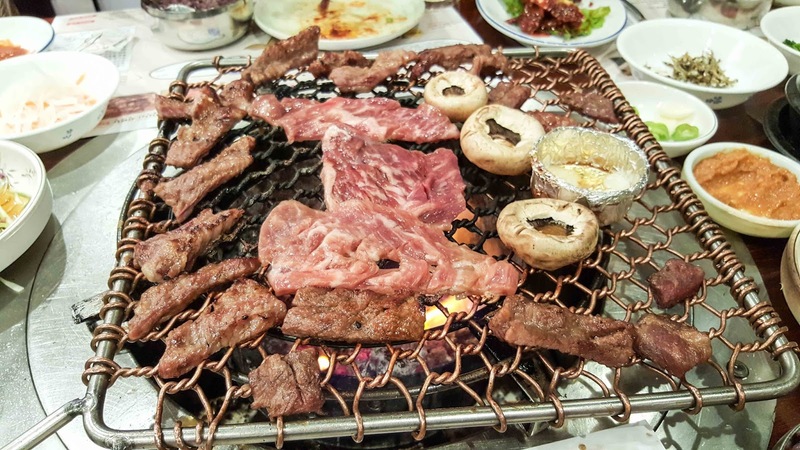 But if you've never been - the reason you should check out your local Korean restaurant is to try the Korean BBQ. 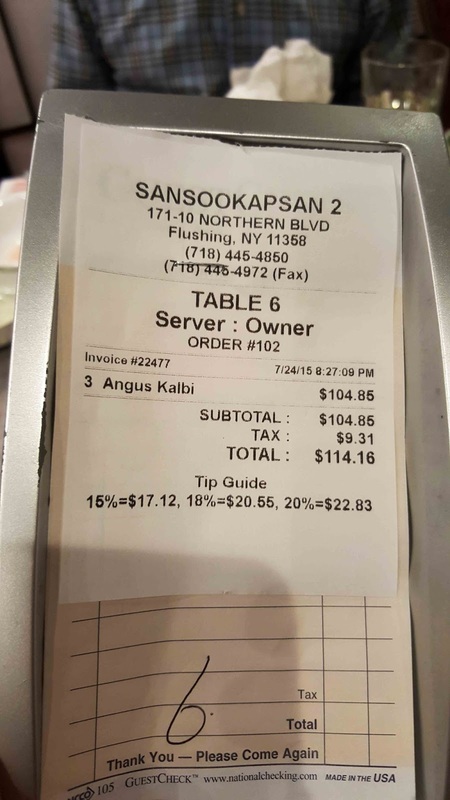 And if you're in Queens, San Soo Kap San will set you right. 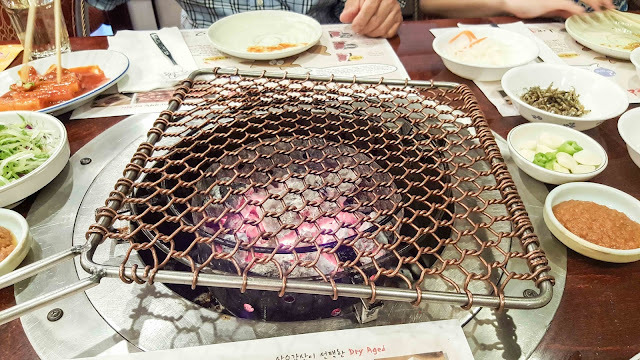 Traditional charcoal bricks are brought to your table. No electric grills here! 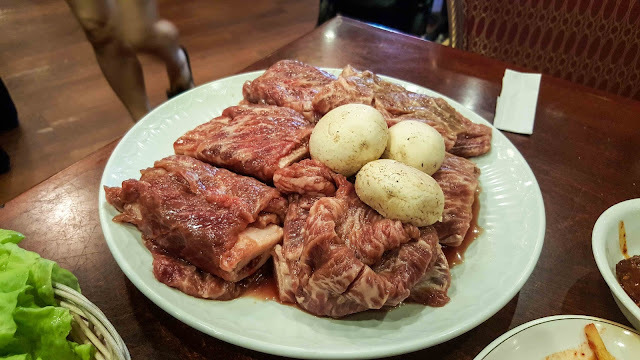 I'd recommend the standard kalbi. I like that San Soo Kap San's isn't overly marinated and they offer good quality ingredients. 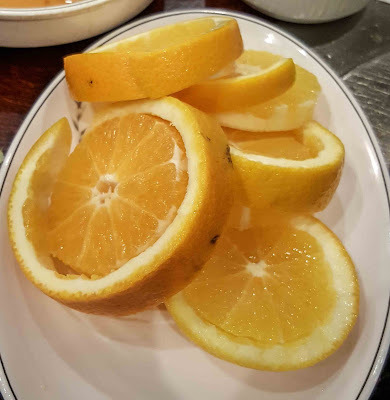 It's also not cut too thin so you can actually taste the beefiness. I love roasting the mushrooms on the grill as well. And asking for a small tin to cook up garlic slices in a bit of oil? Perfection. I like my meat mid-rare, with a quick caramelized sear on the exterior, but you might prefer your meat well-done. It's all completely up to you. Your server will cook it for you, but feel free to take charge. You can try the BBQ alone, but it's best eaten as ssahm or within the confines of a build-your-own lettuce wrap, filled with some beef and perhaps a bit of scallion, fermented bean paste, and some kimchi. At San Soo Kap San, they'll even serve you some complimentary stews along with your Korean BBQ. 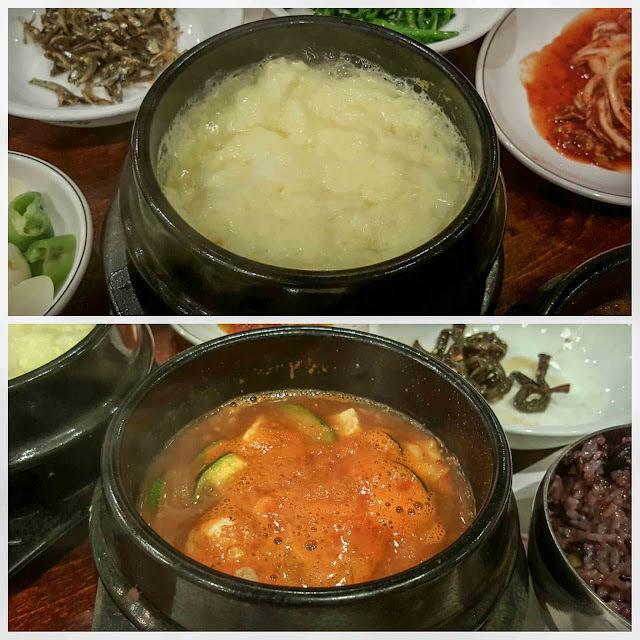 Some favorites of mine are the Korean take on chawanmushi (egg custard) as well as the spicy dehn jang ji gae (fermented bean stew). The latter is a meal on its own with some rice. Perfect for those winter nights. Asian cuisine isn't typically known for dessert and Korean restaurants don't diverge from this status quo. To end your meal, expect some fruit to cleanse that palate! So if you've never been - I'd highly recommend branching out and trying some Korean BBQ. I love that Korean ingredients are becoming more mainstream and non-Asian chefs are looking to ssahm jang and kimchi within their respective culinary toolboxes. Hopefully with places like Southgate Philly, Korean cuisine will have its own place in Center City Philly as well.